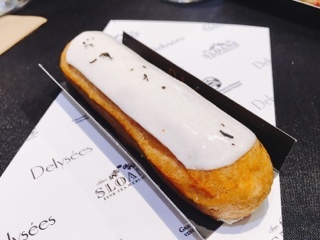 It's easy to see why mini desserts are gaining popularity - éclairs, once the size of a shoe, have shrunken into a petite pastry easily contained within a palm. Things become cuter and you don’t feel bad having one … two… okay maybe three. Recently, I’ve had one of those nights. 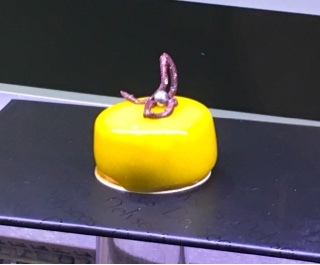 Delysées threw a summer rendezvous event showcasing their line of miniaturized desserts. Bringing along a sweet loving friend, I had intentions of only trying five things and relying on the expert’s opinion instead. 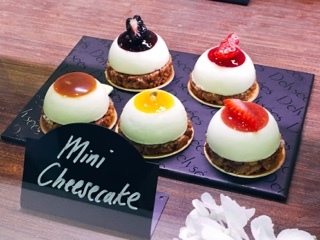 Yet, when I caught sight of the intricate pastries encased in beautiful hues, I started reaching for more. Chocolate lovers should adore their mousse cake and dark chocolate truffle “Rocher”. The cake was fluffy as air incorporating a slight peanut butter finish to the sweet - quite nice. Chocolate and I have our moments: in general I don’t love the ingredient, but when the dessert’s right it can be delicious. I had my doubts about the oversized Rocher, but it turned out to be astonishingly light in the centre while still feeling indulgent. 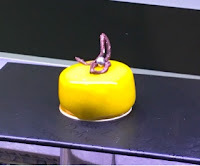 I may not be a wedding planner, but Delysées’ collection of Grange of Prince Edward desserts (a limited edition menu of items infused with their wines) would be perfect for the occasion. 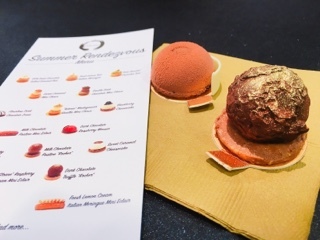 Although it’s difficult to decipher in the picture, their champagne macaron is dusted with edible sparkles! Brides, please try to contain your excitement. 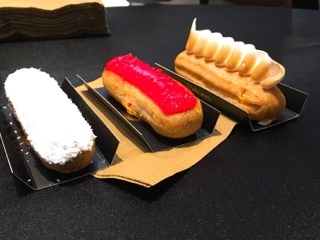 Then there’s éclairs in every hue and texture: a vibrant red one filled with Sloane raspberry cream, a “soft” cloudy looking coconut, and a whimsical meringue filled with a lovely lemon cream. 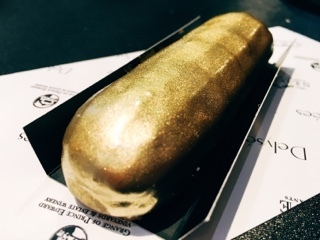 Yet the most jaw dropping has to be blinging éclair fully encased in gold (inside is a hazelnut chocolate mousse). 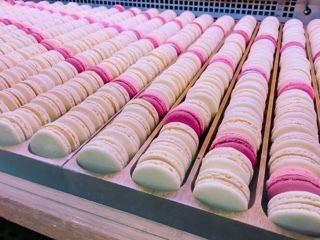 For me, the tastiest is the plain white one – so clean and unassuming looking. 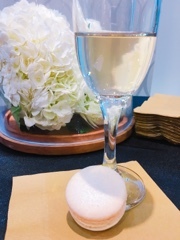 The jasmine yuzu cream piped inside is utterly refreshing and perfect after a heavy meal. Although the tea and citrus both aren’t strong flavours, their tastes were still rather pronounced and delicious. 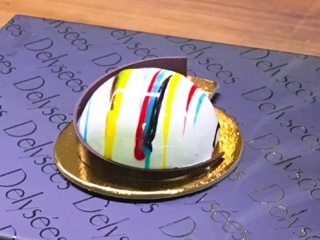 Delysées’ cakes are quite the sight, especially the flourless dark chocolate dome drizzled in blue and pink stripes. The cheesecakes were not overly heavy: the inside incorporating a fluffy almond tofu texture. I only wish the graham cracker crust on the bottom was thinner given the dessert is so delicate and the thick base finishes it like a granola bar. 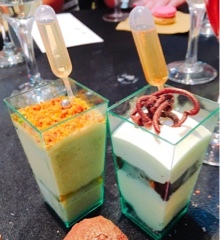 For those who want a shot of booze with their dessert, they even have a line of parfaits crowned with a squeeze of liqueur. An earthy pistachio paired with a whiskey or a crunchy almond cream with Grand Marnier? 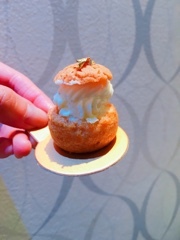 Their mini choux or cream puffs were also tasty. Instead of the typical sweet whipped cream, this was filled with real Madagascar vanilla bean cream. 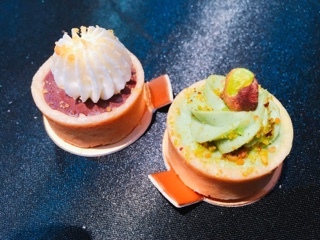 Although more understated than the other offerings, Delysées’ tarts are worth a try: the crust is crunchy yet flaky and the fillings the most flavourful of all the desserts. Pictured below is the dark chocolate & salted caramel and the roasted pistachio. I also tried the fresh lemon tart, which was refreshing and balanced. Overall, the majority of Delysées’ pastries aren’t overly sweet and appear to be flavoured naturally (rather than tasting very strong from the use of artificial extracts). It’s a matter of preference: as a person who doesn’t like overly decadent desserts, it’s perfect. However, if you yearn for the sugary flavourful explosion that can only be subdued with milk, you may be disappointed. 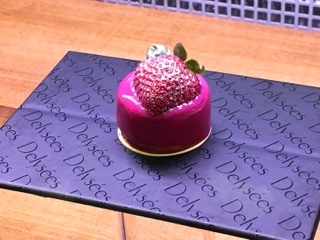 Regardless, Delysées’ new mini collection includes TONS of choice – the above is only a fraction of their overall menu. So, you’ll have to sample and judge for yourself. The fact that they’re the size of a silver dollar? Well, you can just have a few more. Disclaimer: The above tasting was complimentary. Rest assured, as noted in my mission statement, I will always provide an honest opinion.